In its native regions of Asia, eggplant has been cultivated and bred for centuries. This has resulted in different unique types and cultivars of eggplant. It is now available worldwide in all sorts of shapes and sizes, as well as colors. Some may produce bigger and brighter versions of the classic purple eggplant. Others may produce small oval white fruit that truly look like eggs. 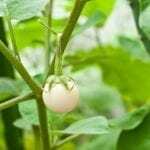 Some, like Ping Tung Long eggplant (Solanum melongena ‘Pingtung Long’), may produce long, slender fruits. Let’s take a closer look at this Ping Tung eggplant variety. Ping Tung eggplant (also spelled Pingtung) is an heirloom plant originating from Ping Tung, Taiwan. The 2- to 4-foot (.61-1.21 m.) tall plants produce dozens of long, slender purple fruits. The fruit is about 12 inches (30 cm.) long and 2 inches (61 cm.) in diameter. 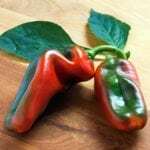 Its tender skin is alight purple which darkens with maturity. The fruit grows from green calyxes and have a pearly white flesh which is drier than most eggplants. It is described as sweet and tender to eat with a mild, never bitter, flavor. In the kitchen, Ping Tung eggplant is ideal for cutting into uniform, bite-sized slices for all your favorite eggplant recipes. Because of the low moisture content in Ping Tung eggplant, it is not necessary to draw out any moisture within the fruit with salt before frying. The skin also remains tender, making it unnecessary to peel this eggplant variety. Ping Tung Long eggplant is also excellent for pickling or as a zucchini substitute in zucchini bread recipes. Though Ping Tung eggplant can get tall, plants are sturdy and bushy and rarely need staking or plant supports. 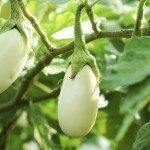 They can tolerate wet or dry conditions and extreme heat, but are cold sensitive like most eggplant varieties. In cool temperatures, Ping Tung eggplant seeds will not germinate and the plants will be stunted and unproductive. 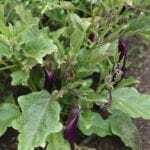 Ping Tung Long eggplant thrives in hot, sunny environments, making it an ideal eggplant to grow in hot, arid climates. Ping Tung eggplant produces best when given a long, warm season. Seeds should be started indoors about 6-8 weeks before your region’s last expected frost. In warm conditions, seed should germinate in 7-14 days. Young plants should be hardened off before placing in the garden, after all danger of frost has passed. Like all eggplants, Ping Tung eggplant variety requires full sun and fertile, well-draining soil. Feed plants every two weeks with a mild organic fertilizer, such as compost tea. Ping Tung Long eggplant matures in about 60-80 days. Fruits are harvested when they are 11-14 inches (28-36 cm.) long and still shiny.